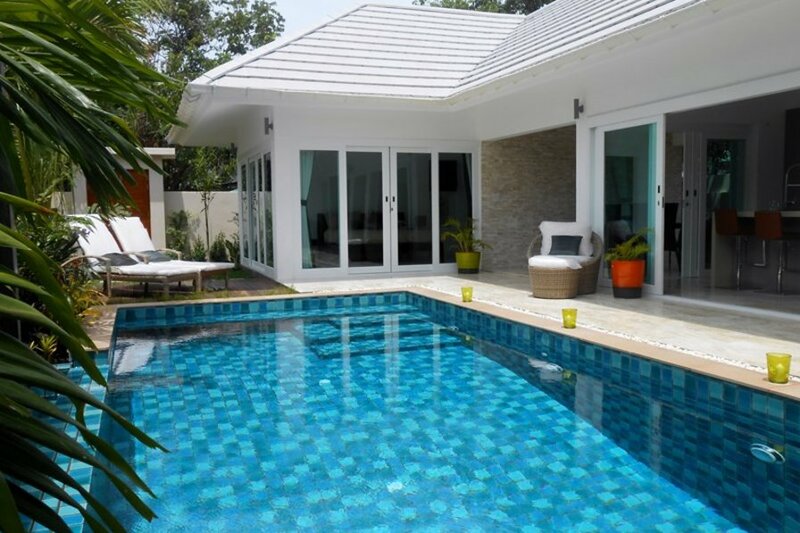 Baan Tai Tara 4, Brand New, Private Pool & Close To The Beach! Quiet, secluded and romantic villa. Beautiful private pool and sun deck. Within thre hundred metres of beach, restaurants and shops. This beautiful villa is a perfect place for a Koh Samui getaway. The villa is finished to a luxury standard and has a hotel type feel. It was designed to make the most of the tropical Thai temperatures. All of the rooms have floor to ceiling windows that open fully back and lead out to the garden, terraces and fresh water pool. The main living area is bright and modern with high vaulted ceilings, comfortable,oversized leather sofa, Smart tv, ipod dock and views out to the pool. The high end kitchen is also in the living block perfect for entertaining. Large centre island with seating, dishwasher, coffee machine, oven, hob, microwave and all cutlery, crockery and plenty of space. Pull back the front set of doors and you walk out to the pool, slide back the side doors and you are in the feature outdoor dining area. Fantastic for evening entertaining or just to relax in the shade. We can also organise your car hire, cycle/motor bike rental, in-house chef service, breakfast/food delivery, babysitter, private island tours. We offer a discount of 20% to couples wishing to rent Ban Tai Tara 4 as a one bedroomed property only. Please ask for details. (Not during peak season). The villa sits in its own private garden with plenty of comfortable outdoor furniture and sun loungers for your comfort.